This replacement exterior door handle is just what you need to get your vehicle's door in good working form again! Note: For 2007 Silverado / Sierra models, the Classic Style has a crease down the center of the door skin where on the new body styles, the door skin is smooth. This part is for the new body style Crew Cab trucks. Very pleased with seller and item ordered. Arrived fast and price was most pleasing. Will be using 1aauto again. It is serving its purpose.. quality isnt the best but for the price I cant complain... verily easy to install, if your a little mechanically incline. The handle arrived quicker than I was told so that was a nice surprise. Fit was perfect. The only issue with this handle is the plastic chrome application is sharp on the handle where there is a seem. I am afraid this will eventually cut someones hand. I dont want to try to smooth it out because Im afraid the finish will start peeling off. Been on the car a week and working! Perfect fit AND cost. Delivered ahead of schedule, too. ???????? Part was of same quality as original. Arrived on time. They were perfect match for oem parts. Videos were a great help for installation. Installed on 8-11-17, simple procedure, as described on YouTube video, perfect fit, operates like oem equipment, so far finish and operation is like new,... thanks for your video and quality parts for a reasonable price. I had a buddy of mine that does auto body work. It took him about 10 minutes to install and he had no issues. Great product. Great price! Part fit and looks just like OE. Delivery was great , on time with ability to track. Good job folks! Life time warranty on part. Will see if it lasts longer than OE. Price certainly was the biggest factor for me to go aftermarket. Thanks. The old door handle had a lot of slop in and was difficult to open at times. Although I ordered the wrong side to start, but was able to get the correct side and had it installed. Excellent item, quick shipping, fits perfect, installation video helped tremendously! 1St time ordering from 1A Auto and i couldnt be happier. Parts were spot on fitment and quility. Service was great and fast shipping. Highly recommend 1AAuto! They know what thete doing! Will biy from them again. Great how to video, and part arrived quickly! Probably saved me big $$$ doing it myself. This handle is great! Arrived quickly and installed perfectly. I did two on my suburban. Each one took about 30 minutes and I was taking my time on purpose to avoid breaking any of the door panel clips. Watch the video for install instructions. You really donâ€™t need to take the door panel vapor barrier off all the way though. Just move the sections where necessary. I was very pleased with the quality of the door handle and the way it fit the Tahoe. 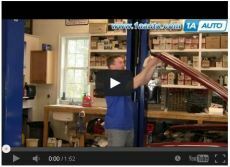 The 1AAuto video was extremely helpful and made the installation go fairly easy. This was an exact match for the OEM door handle on my Suburban. The how-to video made changing this handle extremely easy! I would highly recommend this product. Ordered a replacement door handle for my 2007 Yukon from 1a auto. I also used the free installation video online. Fits perfectly and easy to install with the step by step video. Excellent product. Second item purchased. Excellent video on how to install handle, very helpful. Will continue to purchase. Ive had to replace 2 of 4 door handles on our 2010 Tahoe and this product is great. Both have fit perfectly with no issues during install. Looks exactly like the others. Easy to install and looks great. Will use these to replace the other door handles when they break. The door handle arrived in a timely manner and the quality looked and felt like an OEM part. The 1A Auto video was extremely helpful. My door is as good as new! GM cheaped out on the 2008 Yukon. The outside door handles are plastic and actually break off from the doors. GM wants hundreds to replace them, but 1A auto sells them for under $30.00 and replacement is a simple job as shown in their video. It was shipped quickly and fits perfectly.